I was going through my snapshots today and something really important occurred to me. Even though I live in Texas, one of the most lenient and tolerant homeschooling state, I get questioned quite often by strangers asking why my boys are not in school. I tell them I am homeschooling my sons and I usually feel that I have to follow it up with an excuse to justify my decision. Sad, right? It is still not politically correct to teach your own kids. My most recent response is honestly one of the reasons that I decided to homeschool. My husband works Saturday (his most busy day) and he takes off Sunday and Monday for his weekend. If I sent the boys off to school then they would only have one day to spend with their father. These boys of mine need as much time as possible with their dad. Invariable I get questioned by these same strangers I meet when we are out and about during a school day about whether I think my boys are missing out getting "socialized". Why is that the number one question by curious individuals? If these well-intentioned strangers mean by "socialized" being trapped in a room all day long with 25-30 students their same age and one underpaid, overworked teacher spending most of his/her time trying to keep things under control while teaching subjects forced on them by mandatory standardized tests, then I must respond "No". When I was staring at those photos of my boys playing together, I suddenly realized that because we homeschool, my boys get to spend so much quality time with each other. Time I did not have with my sisters because we went off to public school all day long at the young age of five. I have never heard any one else mention that siblings getting to stay home together was a powerful reason to homeschool. Funny that I never really thought about it myself. My boys are around their parents, cousins, aunts, uncles, and grandparents all of the time. We also have wonderful family friends in our neighborhood with both homeschooled and private/public schooled children. We meet up with other students during the day regularly for PE and chess. And I can drop everything on a beautiful day and bring them to the park, zoo, museum, and festivals. We can take our family vacations anytime we want and not have to mess with summer or holiday crowds. Best of all, I know everyone who hangs out with my boys. And my boys have each other. They are best brother friends. I look at those images I posted above and realize my boys are getting socialized just fine, but thanks for asking! One of the really tough things we face as parents is the constant questioning we face by others. I have faced a lot of this as I have raised my large family too. Thank you for posting this! I have considered home schooling my son when the time comes (in about 3 years) and still have plenty of time to make the big decision. However, I have leaned toward to side of public/private school. Your post is possibly the most convincing case without being "in your face" obnoxious about it. And it makes a lot of sense to me for siblings to spend as much time together as possible at this age, as it could set the stage for deeper, life-long friendships. I have homeschooled all 4 of my children - the oldest graduated last spring. There is an age gap between my oldest son and the younger 3 (4 years between my first and second) Homeschooling has allowed the bond between my oldest and the younger 3 to stay strong. It is considered so normal for teens to pull away from their siblings and we accept it as par for the course. While there has been some natural detaching, my 3 teens and 1 preteen have remained close with strong bonds that amaze me. 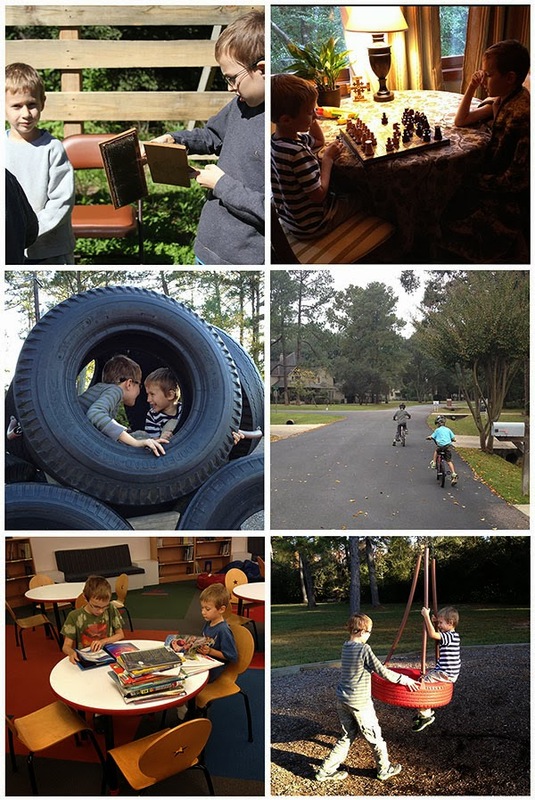 Sibling relationships have been one of the very best thing about homeschooling! The extra time my daughters get to spend together is definitely a huge reason I love homeschooling. My oldest is 8 and her sisters are 3 and 10 months. The younger two ADORE their big sister and they spend a lot of time playing together during the day. Another big plus for us has been the extra time my 8yo has to play and experiment on our piano (composing her own songs) and extra time to follow other interests as well. Socialization is the question we get most often too. I usually tell people they should take a look at my calendar - for "home" schoolers we sure aren't home as much as they must think! ;) Our calendar is packed with fun activities, field trips, and events. I home schooled and now my grand children are home schooling. When we were home schooling 25 years ago in small town America it was not the thing to do. I was given tons of unsolicited advice from well meaning parents who sent their child to the local government school. Today, my kids are doing well. Many of theirs are not. My children have all risen to the top in their chosen field. They are honest, hard working, show up on time and quickly promoted. Wen they were small, though, I remember the questions. And the comments. But - my REAL reasoning for home schooling would make the commenter stop and think and then even consider that what I was doing might actually be right. My response was.... You are either for God or against God - right? No one can argue with this. It's a Biblical fact. We can't sit on a fence, we have to be on one side or the other. So - they would respond - correct! They, I would simply say... can the local public school honestly say they are for God? Nope.... so, if they are not FOR GOD, they are AGAINST GOD, right? Normally the reply would be, Well, yeah.... according to the Bible, they would be. Then I would simply ask, "Why would I sent my child to a school that is against his God?" It's really something to think about. Even a school has to be FOR or AGAINST God and in the case of the government schools, they are AGAINST Him. This is not a fitting place for a Christian child. My oldest son and his wife home schooled their son through grade and middle school. He is now 16, and does go to public, but I feel he had the best start because they were able to keep him close and adhere to their teachings instead of the influences of how other kids at a young age were being raised. He's the best young man and loves FFA and his animals. He's not lacking socially because they let him be in sports. They got the usual comments also and even some from family. I think maybe parents feel intimidated by the home schooling because maybe they feel it's a reflection on their choices rather than the home schooling parents. If I had it to do over again with my kids, I would definitely choose home schooling. I have 3 boys (10,7,3) and we homeschool as well. My oldest 2 can fight about anything but they really are each others best firends. The youngest just enjoys being with them and we all enjoy being a family. That family first mentality is such a blessing. We also enjoy taking vacations at "non-peak" times! I loved reading all of your comments. It sounds like we are making a good choice for our family right now, and I see you guys have had your own struggles. I think it is just important to follow our hearts as parents.